Pre-heat the oven to 180°C/350°F. Beginning at the breast, slightly loose the skin of the chicken with the stem of a spoon, taking care not to damage the skin. Set aside. Chop garlic, just over half of the sage leaves, and cranberries. Using a fine grater, completely zest one blood orange, squeeze for juice, and set aside. Cut remaining blood oranges into slices. Melt two thirds of the butter in a small pot. Add blood orange zest and juice, cranberries, chopped sage, and garlic. Season with salt and pepper, stir to combine, and let simmer for approx. 3 – 4 min. Set aside. Grease a roasting pan with some butter. Layer blood orange slices on the bottom of the pan, keeping at least three slices for serving. Spread some butter underneath the chicken skin, between the breast and the skin. Transfer chicken to the roasting pan and brush blood orange sauce over it with a pastry brush. Bake at 180°C/350°F for approx. 60 min., basting with blood orange sauce approx. every 20 min. Roast sliced almonds in a frying pan for approx. 3 – 4 min., or until golden brown. While the chicken is roasting, cook the polenta. Add vegetable stock and milk to a pot. Season with salt and pepper and bring to a boil. Stir in polenta while whisking. Let simmer over medium-high heat for approx. 15 min., whisking constantly. Once cooked, add grated Parmesan and remaining butter. Serve polenta in bowls and top with roasted almonds. 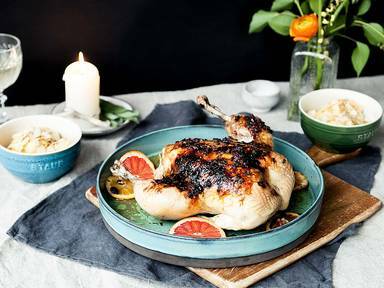 Remove chicken from oven, serve whole, and garnish with remaining blood orange slices and sage leaves.